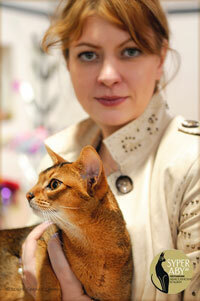 My name is Liubov Beresneva and I am glad to welcome you to Cattery "SUPER-ABY". 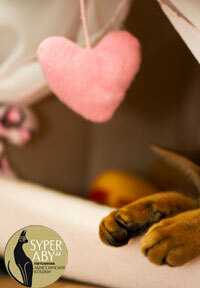 "SUPER-ABY" specializes ONLY in the breeding of Abyssinian Cats. The main purpose of Cattery "SUPER-ABY" is the breeding of SUPERIOR gene lines for excellent breeding stock cats to be used for breeding and for companionship. Exhibitions and Media exposure for the popularization of the Abyssinian Breed are of the UTMOST importance. All of the Kittens of Cattery "SUPER-ABY" are constantly monitored for their best health and have all necessary inspections and vaccinations. Proper care and feeding are of course, most important for optimum health. We only use foods of the Highest Quality. Only foods with high absorption and low PH and magnesium content will be used. 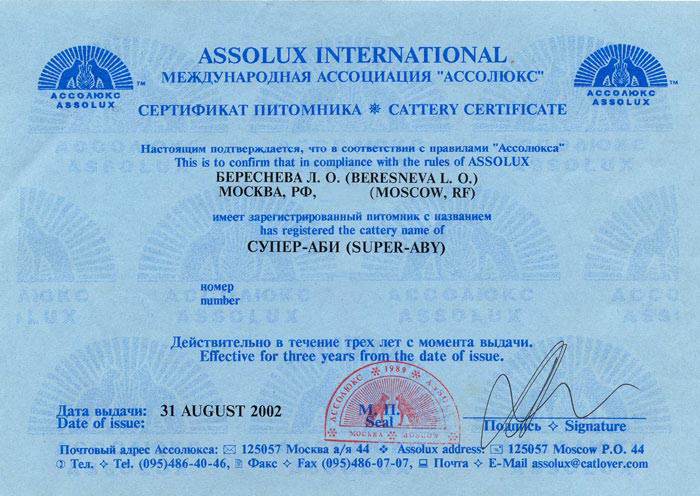 Cats from "SUPER-ABY" attend international exhibitions regularly, and have returned with honors. The kittens of "SUPER-ABY" are reared with care, concern and love and as a result, they have outstanding health and remarkable good nature. The owners of kittens purchased from "SUPER-ABY" are ensured of continuing support and advice. 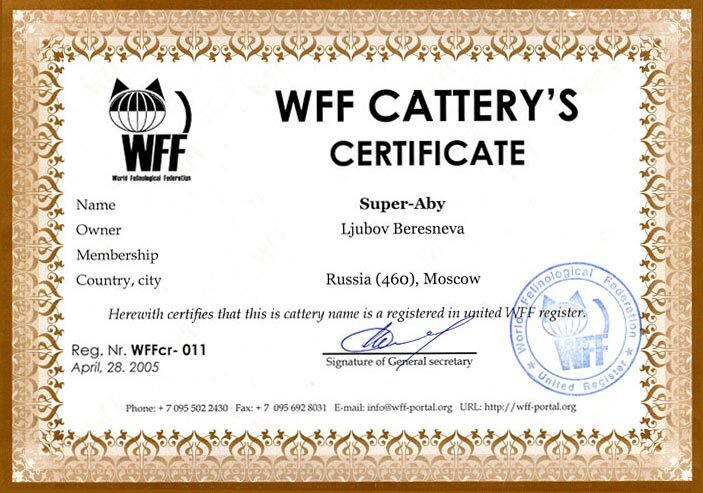 Cattery "SUPER-ABY" was registered in 2002 in the exhibition system "Assolux Int", also a member of WFF (World Feline Federation) and CFA. "Super-ABY" is constantly in search of Superior Quality Breeding Stock and recently we have taken on several new breeding lines. Silenthunter's Kalama and Silenthunter's Jeruk are both Sorrel, and Super Kitty Night Hunter's Breeze - color Ruddy. At "SUPER-ABY" we have found a correct manner of breeding which brings many successful, superior Breed Correct Happy, Healthy Kitties who become happy, healthy cats. I am very happy, that these splendid animals exist in my life - they are all "SUPER-ABY"